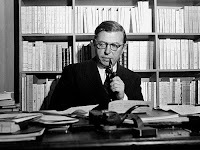 The first work of philosophy I ever read is Jean Paul Sartre's article "Existentialism is a Humanism." That was a long time ago when I was a freshman in college, but I still like the article today. If you look at it carefully, you'll find much to criticize, but the article is full of good ideas. The main point of it is that we are responsible for our own choices. You can't say you had to choose X because of....a book, a moral theory, a religious idea, an adviser, or even your feelings. You chose the book, the theory, the idea, the adviser, and you even chose how to interpret your own feelings. What happens when you own up to your own responsibility? Sartre says you've got to see that you have a huge weight on your shoulders, because you choose for all, not just for yourself. Not literally, but "human nature" is something we're all continually fashioning. It's not "up there" in God's intentions or "in here" in our genes but continually created through our choices. If you lie, cheat, and steal, that's your contribution to what humankind amounts to. Are you sure you want that to be your contribution? Once you own up to your responsibility, and admit the weight that's on your shoulders, then what? Here's where you might not be entirely satisfied with Sartre. He says you must "just choose." But it seems as if that's the point when you should actually think things through carefully, looking at the reasons for doing this or doing that. There might be better reasons for one option and worse reasons for the other. I might admit my responsibility, and feel the weight on my shoulders, but "just choose" badly. Sartre has a famous example of a young man who's choosing between staying with his ailing mother and joining the resistance. All he can do, says Sartre, is...choose, in full awareness of his responsibility. But what if he were feeling pulled between staying with his ailing cat and joining the resistance? Or between running off to get rich in America and staying with his ailing mother? By focusing on a particularly difficult dilemma, Sartre makes it seem as if every choice is basically a toss up. Not so. Sometimes the best reasons are on the side of one option, not the other. Still Sartre has a point--it's you who must sort out the reasons. We surely reason badly when we pretend that reasons fall out of the sky. If I've ever read any Sartre I've forgotten it........but could he be saying that eventually you have to "just choose"? Because we have to make so many decisions in life on impeffect and often totally inadequate information? Better just to choose than to get paralysed by analysis? Better, in other words, to do something, anything, than nothing? Because if so, I agree with him, to a first approximation. Well, doing nothing is also a choice. Deciding to not make a decision is a decision! And so on, and so forth. The binary nature of the typical philosophical conundrums betrays what happens in the real world. Very, very rarely are we supplied with just any number of definite options. Mostly we have to figure out what the choices are, and then decide what to "do". Most people (I suspect) try and make the best decision they can at the time. Sometimes it proves to be the wrong decision, sometimes the right one, mostly it's not as cut-and-dried. Join the resistance or stay with an ailing mother? Is there any way he can use his ailing mother as a cover for his resistance activities? I shifted this over to Talking Philosophy for possible further discussion...I'm still thinking about whether "just choose" is bad advice. I see what you're saying, potentilla, eventually you do have to do that. Wow Potentilla, I miss her. Anyway, Sartre would say that you have to choose what you consider to be good reasons. You have to choose what you consider to be good, etc.